In the following article, we describe Magento 2 shared catalogs: define ones, shed light on how to create them, explain the nuances of sharing, as well as provide tips on their import and export. If you don’t know how to transfer, import or export shared catalogs between your Magento 2 store and an external e-commerce website, you’ve come to the right place, but let’s first define what shared catalogs are. As you might have already guessed, shared catalogs are a B2B feature. When you want to share a discount with one of your partners while others should not know about it, this Magento 2 instrument comes in handy. As a Magento 2 administrator, you get the ability to set special rules – custom pricing – for different companies/group of users including the visibility of categories and products. Such, you can have different product catalogs available for different customer groups/companies. Magento 2 offers two types of shared catalogs: Public and Custom. While the former is the default shared catalog displayed at the storefront to guest and not-logged-in customers, the latter is visible to assigned users associated with a special company only. A Public shared catalog is created during the B2B installation automatically. Note that Magento 2 allows you to have only one public shared catalog unlike Custom shared catalogs which number is unlimited. Ans, as you might have already guessed, it is possible to assign Custom catalogs to specific companies. First of all you need to have Magento 2 B2B extension installed on your Magento 2 instance. Good news is that the B2B extension is available free of charge, however only to Magento 2 Commerce/Cloud users. It is also necessary to mention that you can still have a master catalog in addition to the Shared one. If the latter is enabled, the original master catalog continues to be visible from the Admin only. As for the frontend appearance of your e-commerce store, the system displays the Public shared catalog instead. The Shared Catalogs page is available under Admin Sidebar -> Catalog -> Choose Shared Catalogs. Magento 2 offers two ways to create a custom shared catalog: add or duplicate. Note that a newly created catalog includes no products. Furthermore, it is not assigned to any partners. When you create a custom shared catalog, the system automatically generates a new customer group by the same name. As a result, you should assign customers (your partners) to the newly created customer group to share the catalog with them. Unlike a newly created shared custom catalog which does not include products, custom pricing, or company associations, the public one is automatically assigned to guests and customers who are not associated with a company. Under Admin Sidebar -> Shared Catalogs, tap ‘Add a Shared Catalog’ in the upper-right corner. Enter a new shared catalog name which will be displayed throughout the Admin and customer dashboard as well as assigned to a newly created customer group. Choose the appropriate Customer Tax Class. That’s it! 5 small steps – and you’ve enabled the robust B2B feature without installing any third-party modules! Now, you can find the new catalog in the Shared Catalogs grid. Go to Admin Sidebar -> Catalog -> Shared Catalogs. In the Action column of the grid, choose General Settings. Update the following parameters of the catalog: Name, Type, Customer Tax Class, Description. You can find the new catalog in the Shared Catalogs grid with a unique ID. Now, configure the appropriate product selection, company assignments, and category permissions. Unfortunately, it is impossible to import, and export shared catalogs in Magento 2 by default. But you can always rely on third-party modules that extend the default functionality of our favorite e-commerce platform. Therefore, we’d like to introduce you to the Improved Import & Export Magento 2 extension with B2B Add-On – your number one time saver when it comes to all possible data transfers. The plugin provides the ability to move most Magento 2 entities including shared catalogs. If you don’t want to spend time on recreating them on your new website, give our extension a try. Under System -> Improved Import / Export -> Import Jobs, hit the Add New Job button. Configure General Settings and proceed to the Import Settings section. Here, you can select Shared Catalog in the Entity drop-down. As for the Magento 2 shared catalogs export, you can configure it under System -> Improved Import / Export -> Export Jobs doing similar actions. 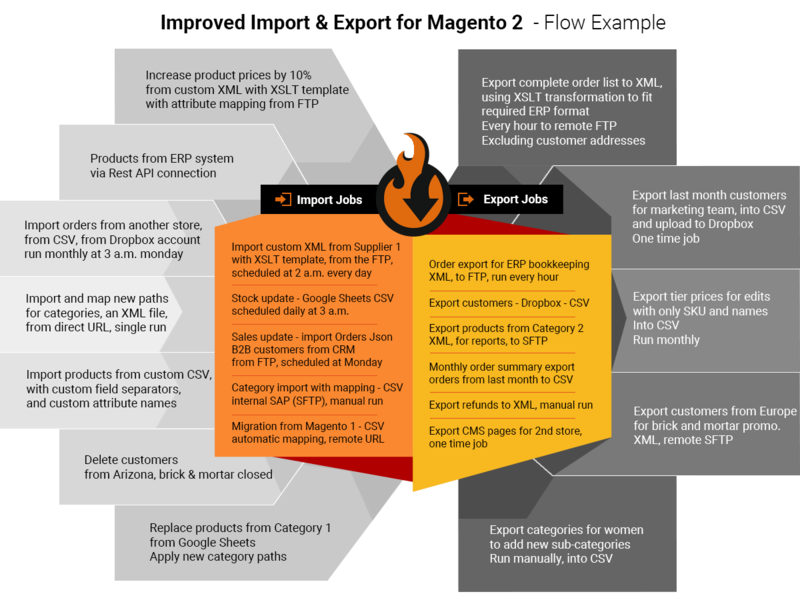 If you require extensive instructions on how to import or export Magento 2 Shared Catalogs – read our dedicated Magento 2 B2B import/export blog post. In this post you will find every Shared Catalog attribute described with sample values and sample import tables you can start your import with. Firebear team has also composed a dedicated Google Sheet B2B Master Table where you can find the sample table for shared catalogs. 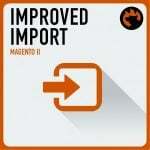 Now, when you know how to import and export Magento 2 shared catalogs, we should also draw your attention to other features of the Improved Import & Export extension. Our module will help you automate all data transfers, solve problems caused by different attribute standards, and match external categories to ones used in your database, but let’s take a look at the extended connectivity options provided by the plugin first. The Improved Import & Export module dramatically extends the native Magento 2 connectivity standards that are quite limited. By default, the platform lets you import and export information with the help of CSV files only. Our extension not only supports multiple more file formats but enables you to use other ways of transferring data. Since the Magento platform bounds you to CSV files only, you should always convert other formats to this standard to make import processes possible. And the opposite procedure is necessary when you export data to external platforms which don’t work with CSV files. As for the Improved Import & Export Magento 2 extension, it entirely solves the problem extending the number of supported standards. In addition to CSV, our module offers the ability to use XML, JSON, ODS, and Excel files. Note that all standards are equally supported so that you can apply all features of the Improved Import & Export extension despite the chosen file format. FTP/SFTP. Use a local or remote server to exchange data between your e-commerce website and an external platform. Besides, the Improved Import & Export Magento 2 extension unpacks compressed data automatically, so that you can freely import archives with data files right into your store. But data files are not the most flexible way of integration. They are not flexible at all and has many limitations. Instead, you can use direct API connections with the Improved Import & Export Magento 2 extension. Thus, our module provides the ability to connect to an external system directly. To build a bridge between two systems, our module lets you use REST, SOAP, or GraphQL APIs. To improve your daily duties and release some additional free time, the Improved Import & Export Magento 2 module lets you automate all data transfers. Instead of relaunching import and export processes every time a new update is provided or required, let our module do everything for you. The extension offers two different ways of automation: schedules or event-based triggers. Let’s explore each feature separately. The most common way of automation is based on cron. Use its default syntax to create custom update schedules. Alternatively, you can select one of the predefined intervals. Since the extension incorporates the same interface for both, each predefined range can be customized as well. At the same time, you can create profiles that have no schedules. Due to single data transfers and asynchronous updates, you may face the necessity to import data only once or do that in a random order. In addition to cron-based schedules, the Improved Import & Export extension allows utilizing event-based triggers. Being an alternative way of automating import and export processes, this feature enables real-time updates. For instance, you can set a trigger on the basis of a placed order. When a customer completes checkout, this trigger can launch an order data export to an external system. The Improved Import & Export Magento 2 extension lets you select either system events or custom processes as triggers. Choose specific conditions to increase their efficiency. For further information, read this article: How to Run Magento 2 Import or Export After Specific System Event or Process. And of course, the Improved Import & Export extension enables you to do everything manually. This method will save you if a preset for a particular integration is absent. Of course, you can contact our support and ask for help, but it will take some time until we will propose a solution. If you need to run the integration immediately, leverage the convenient interface and match everything manually. As you can see, the gif above shows three columns one of which is called “Default Value.” It allows setting a value provided to all items related to the attribute. Thus, you can specify hardcoded attribute values with the Improved Import & Export Magento 2 extension. For instance, you import products related to different store views, but your website contains only one store view. Instead of editing a data file manually – you won’t be able to import such products – link all products the same store view via the hardcoded value feature. In addition to attributes, you can also map their values. Our module utilizes the same principle for modifying them as we’ve just described. Although third-party values usually don’t prevent import processes (but there are situations when they do that), they require lots of time and effort for editing after an update is already transferred. That’s why we provide an intuitive interface designed to simplify attribute values mapping as much as possible. Forever forget about manual data file editing and endless admin modifications with the Improved Import & Export Magento 2 extension. The module allows matching third-party attributes to their internal designation and then repeating the same action for their values. For further information, follow this link: Attribute Values Mapping. Combine them and create special conditions to increase the efficiency of applied changes. 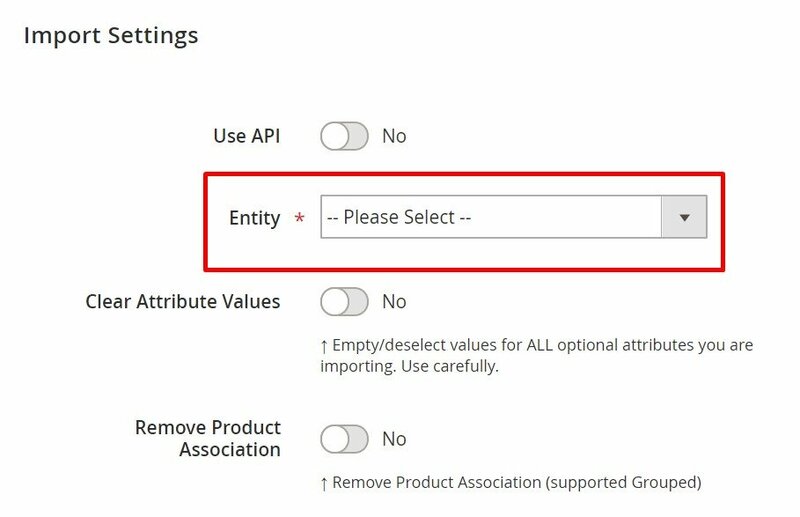 For further information, read this article: How to Modify Attribute Values During Import and Export in Magento 2. And you create new categories on the fly as well. The process is simplified to selecting a parent category and specifying the name of a new one. Both features are described in this article: Category Mapping. More information is provided here: Product attributes import. 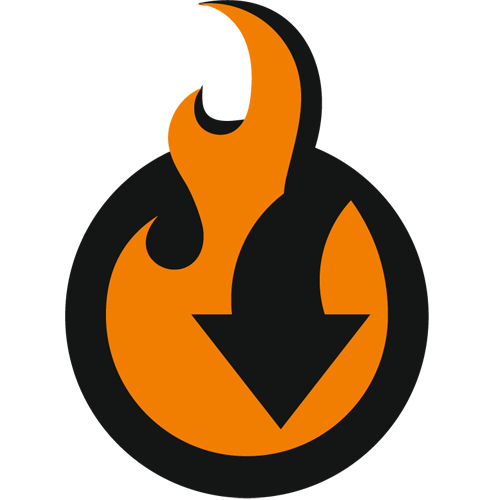 If you require more information on how to import and export Magento 2 B2B entities or any other entity of your Magento 2 store, you might want to have a look at Firebear explicit Magento 2 import/export Guide List. We have gathered and put to good use much more information on Magento 2 import and export than Magento 2 team ever had! Please feel free to read and share every guide you need.